So friend…it’s time for another Pantry Challenge MONTH in my kitchen. Actually, it’s been quite a while since I’ve done an entire month on a pantry challenge, but it’s time because the pantry is stocked, the freezers are both pretty full, and there is plenty to eat around here! 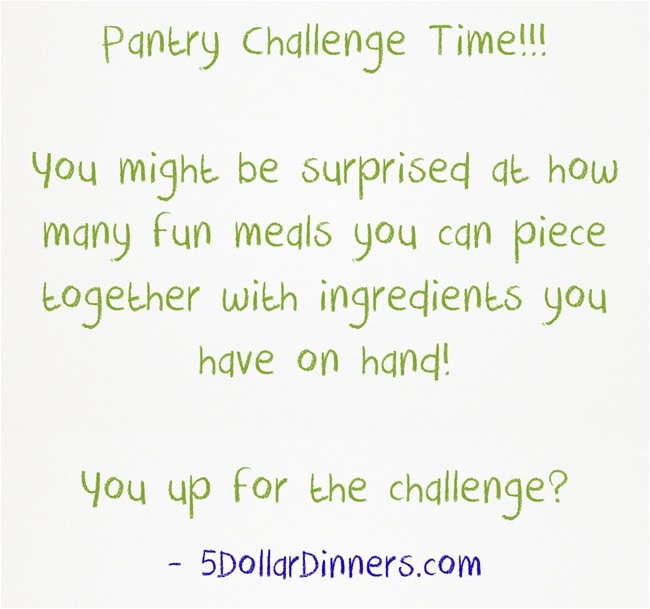 Perhaps you’re in need of a pantry challenge too?! One of the reasons that the pantry is fully stocked is that I’ve already ‘done’ plan #7 in the 20 Meals for $150 series, so the cupboards are full. Spend no more than $30 each week on fresh produce & other ingredients I might need for this month’s meals (including 2 church group potlucks and a meal delivery to one of the boys’ PK teacher who recently fractured her skull…OWIE!) . Only 2 meals out on the town. We generally only eat out two or three times a month, but for this month we will make it just twice. Stick to a specific meal plan and use up most or all of the freezer meals that I have in the freezer from plan #5 and plan #6. Bake, bake and bake some more – lots of homemade treats coming our way this month! Planning on baking muffins and banana bread for lunch boxes and cookies and ‘energy bites’ for after school snacks. I’m going to have to work hard on the homemade treats to keep up with these 4 bottomless pits that I have running around, but I think I can do it! I’ll report back each week on how things are progressing and what we’ve been eating! I have 15 complete meals in the freezer from plan #5 & 6. I’ve also got a few different cuts of meat that I’ve frozen, but haven’t made into a complete meal. I have a pile of beans in the pantry that I need to use up…along with a big stack of corn tortillas. I think that’ll be perfect for some bean enchiladas…of some kind. I’ve also got quite a bit of frozen fruit in the freezer, so there will be lots of smoothies happening this month! Some kind of bean soup! I know I can get through these first couple weeks…it’s the end of the month that has me a little nervous….will I make it all the way through?! Stay tuned to find out…I’ll be sharing progress and shopping trips each week! How funny! As a family, we decided on a no-spend February, where we will only go out for Valentine’s Day (and probably to lunch, since it’s less expensive!) and eat out of our pantry, and only get fresh stuff from the store. Amazon Prime is going to wonder what’s wrong with us! We’re seeing what we can really live without, to be able to meet our family goal of buying a home. What a fantastic idea and goal! It’s amazing how these kinds of challenges make your ‘needs’ and ‘wants’ more clear! I love your goal…keep at it!